At Sonic Interactive Solutions we love being able to provide ALL the services our clients require to have amazing websites. 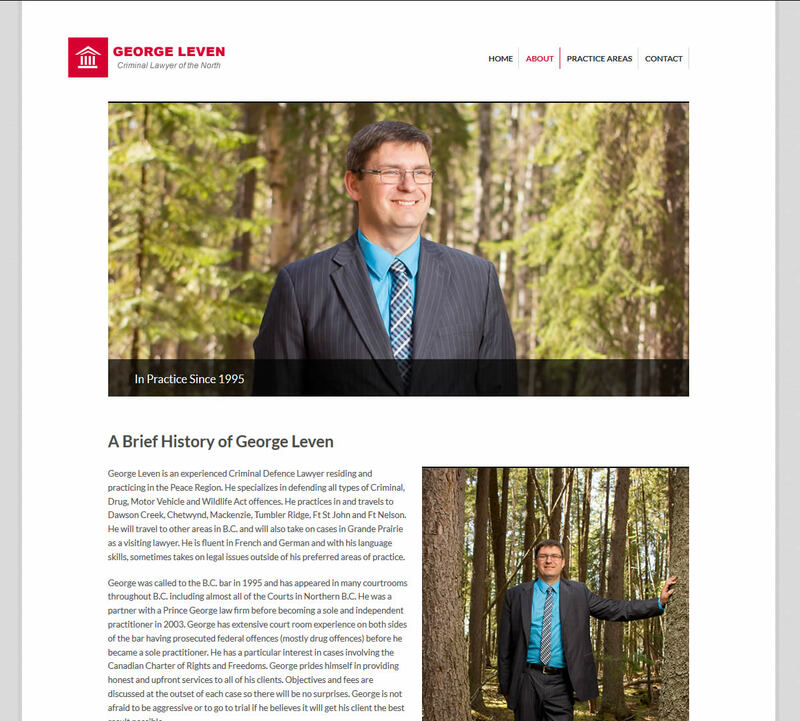 We were recently contracted to do a web site for a lawyer named George Leven. We had so much fun with him!! Now, I hate to sound like I stereotype people, but I never thought that working with a lawyer could be such a good time! Harold Alkema recommended us to George and we are so glad he did! George had a few ideas about what direction he wanted to go with his website. He wanted something “professional, clean, simple and highly functional”. He wasn’t concerned with having an enormous amount of information on his page because he told us he “prefers to meet with [his] clients” to discuss things in detail with them. George didn’t really have a theme or colour scheme he was committed to so that was up for our interpretation. George is an avid outdoorsman and loves to hunt. This was evident when we first met with him as he had a stag head next to his name on the website which hosted some of his information. This gave us the idea to do some professional portraits of him in the wilderness. We wanted to portray George as a professional but also infuse his passion for the outdoors and ‘hunting and gaming law’ into his website design. 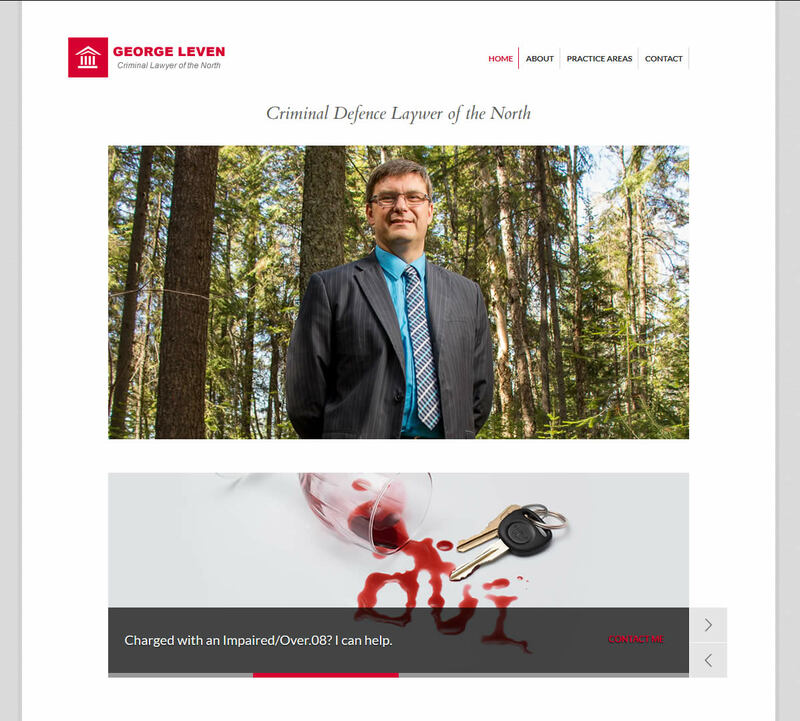 We chose to create a site which had a professional colour scheme of red and grey and to put George’s pictures from our outdoor shoot on each page to encourage those whom are ‘outdoors oriented’ to connect with it. We weren’t sure if George was going to like the idea but when we proposed an outdoor shoot he was very much on board. After George’s (wonderful and fun filled) photoshoot at L. C. Gunn park we got onto constructing the website. 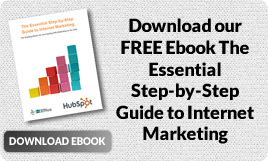 We chose a simple and forward format and a clean cut colour scheme. We started to input the body of information into the website and found stock pictures to accompany the various areas of practice that George provides. Stock pictures, especially good ones, can sometimes be expensive so once we knew what direction we wanted to go with the pictures, we decided to recreate them ourselves. We did end up buying a few pictures off iStockphoto.com but the majority of the photos on the site are ours. We have really enjoyed the growth that this practice has offered us; by photographing all the pictures on a website we are exposed to many, otherwise obscure, photography challenges. It’s hard to grow without a good challenge! George has been one of the best clients we’ve had. He hasn’t been the largest client we’ve had, but he’s been punctual, persistent and pleasant from start to finish. We are so happy to provide any service he needs we would go out of our way to help him. 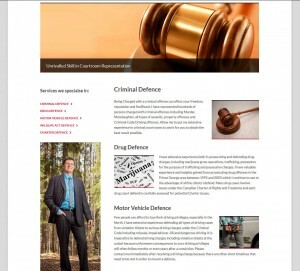 If you need a website and would like a free consultation please don’t hesitate to call us @ 250-961-4255 to set up an appointment.